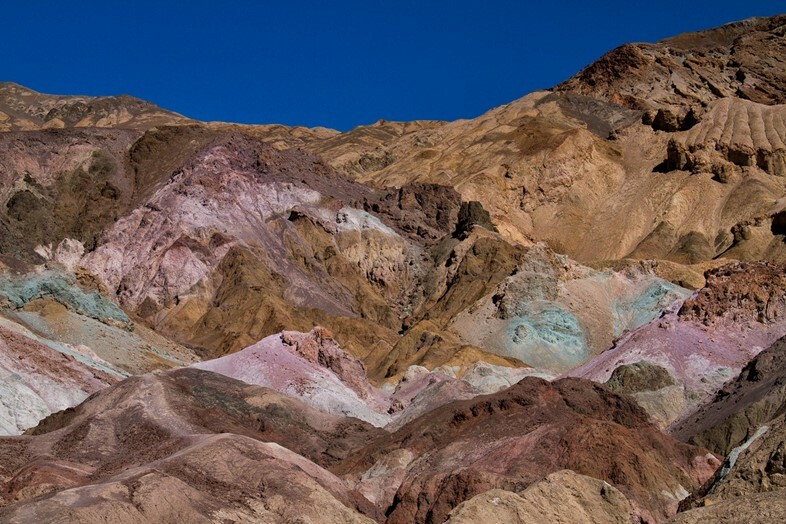 Shaped, sculpted and scarred by the earth’s natural forces over the eons, Death Valley is a surreal landscape of extraordinary and extreme beauty, weather and geology. Summer temperatures regularly rise into the forties and once reached 56.7°C – the highest air temperature ever recorded on earth. It is home to the lowest point below sea level in North America but not far from the highest mountain in the continental US. Seasonal rains bring flash floods that wash through its canyons, yet for most of the year the valley sees scant moisture – with ephemeral lakes slowly evaporating to form crystalline, crumbling salt flats. To drive through Death Valley is like piloting a spacecraft across the surface of an alien world. 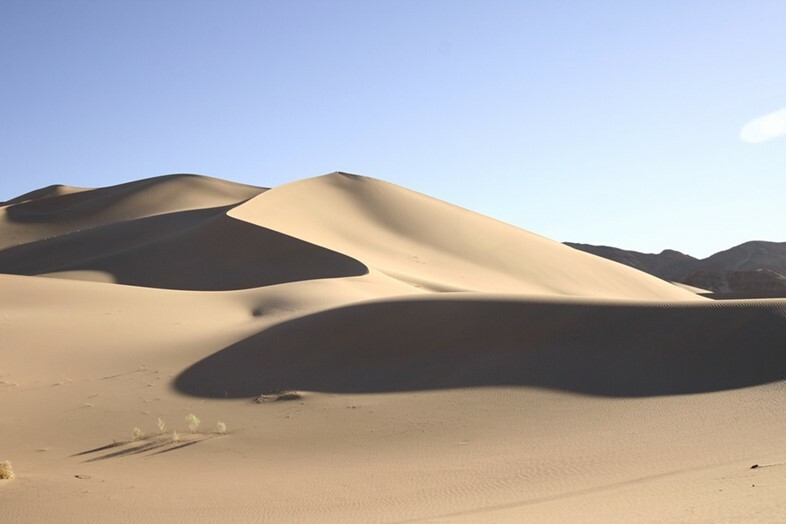 In the heat and desolation, a vehicle becomes a mobile life support system – a small speck of air-conditioned habitability in the vast emptiness. Mirages dance across the salt beds, oases of palm trees stand in stark contrast to the distant hills, and everywhere the land itself reveals how this part of the continent was shaped – through canyon walls carved from marble and volcanic cones ripped in two to wandering sand dunes, striped islands rising from the flatlands and otherworldly formations like Artist's Palette. Etched into an alluvial plain flooding out from the Black Mountains, this incredible rainbow of colour spans a soft, pastel spectrum ranging from pinks to blues to green. It was formed when volcanic rocks deep underground interacted with hydrothermal systems to form concentrated mineral deposits. Erosion and chemical weathering revealed and reworked the rocks, and the oxidation of different metals created the subtly striking hillside. Iron-rich hematite produce the reds and pinks, yellows and golds seep from various iron oxides, volcanic ash deposits form the greens and manganese creates the purples. 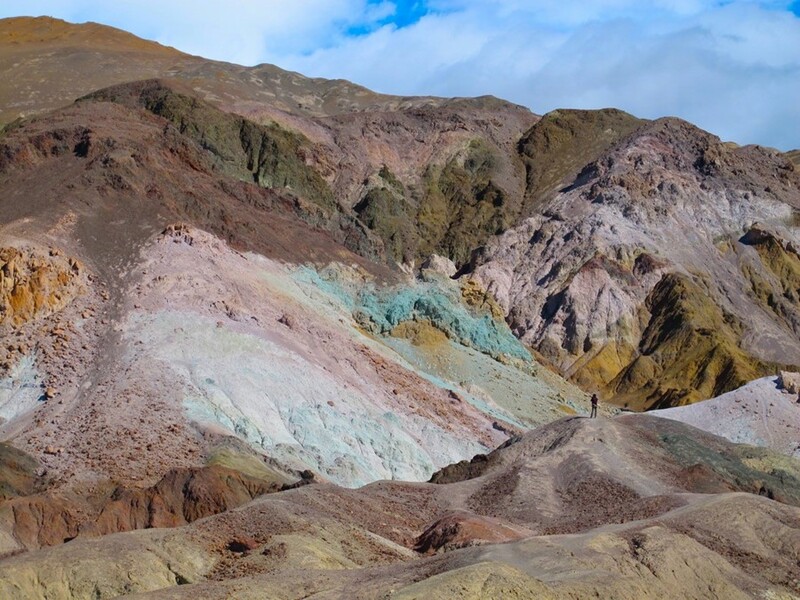 Beyond its intense Instagram potential, Artist’s Palette reveals the volcanic forces which shaped the land in the Miocene Era. 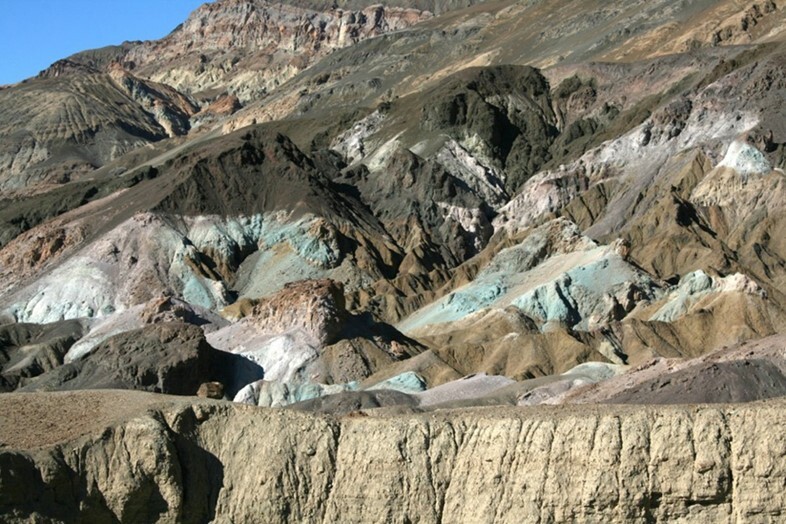 Once upon a time, over 500 million years ago, Death Valley was covered by warm, tropical seas. California had yet to join up with the rest of the continent, and the whole region lay further south, along the Equator. Time and continental drift marched on, before a series of tectonic collisions and volcanic eruptions rocked the west coast, stretching and tearing and cooking the rocks. After 150million years of chaos, things calmed down and the slowly, steady erosion began. Several billion sunrises later, humans appeared on the scene – and for a thousand years the Timbisha Shoshone people were the only witnesses to the hidden beauty of Death Valley and its silent, vibrant soils. Artist’s Palette is relatively easy to get to. Best visited in the winter months unless you’re a masochist, Death Valley is a 5hr/300mile drive from LA or a 3hr/130mile trip from Las Vegas. You can go by bus, but getting around is hard – the car is king in this part of America. Make sure you keep your petrol tank and mobile phone topped up and bring plenty of water. Artist's Palette is part of the Artist Drive scenic loop, located 10 miles south of the Furnace Creek Visitor Center on Badwater Road. The national park service recommends visiting towards late afternoon/sunset when the colours are especially vivid. Click here for more information. Next week, Where On Earth visits the largest lava lake in the world, at the Nyiragongo volcano in Democratic Republic of Congo.